Steel Mart (Material Handling Division) is an ISO 9001/2008 certified company and supplies all kinds of lifting equipments & accessories. The materials offered are of guaranteed prime quality. Awaiting your positive reply in the form of an inquiry to enable us to submit our rates/terms. 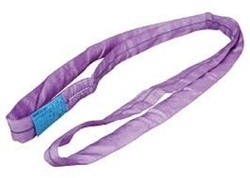 We offer Polyester Webbing Sling Belts which are made from premium quality high strength yarns. These are available with metal end fittings and offer solutions for most of the lifting needs. Available in various sizes and lengths. The normal Polyester Sling is manufactured by 100% Polyester Yarn only, which is non-conductive against flowing of any type of electricity. But we have manufactured special coated Polyester Anti-static Sling which is having a conductivity property of any type of electricity. These multi leg slings are available with various types of end fittings. These are innovatively designed keeping in mind their performance. We provide customized multi leg slings as per the client’s specific requirements. Because of the boundless associate, our firm is refined to present Polyester Round Sling. Being a quality driven organization, we offer slings that are in comply with quality standards to meet our client requirement. Our range of slings is highly acclaimed for their durability and specifications. Webbing and round slings and lashings of polyester material are available. These slings can be specially designed to suit different purposes, and can be endless or with loops. The slings have a Load capacity from 200 Kgs to 20 tonnes. Our company specializes in manufacturing and supplying a wide assortment of Polyester Round Slings. 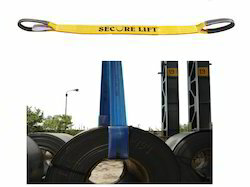 The steel used in manufacturing these slings is sourced from trusted vendors of the market. These products are widely availed and used by various constructions, engineering and other related firms.